When it comes to Diabetes, ‘Self-Management’ is a critical part of therapy. Being aware of your blood sugar levels enables you to lead a normal, healthy life and mitigate any possibilities of it escalating to dangerous levels. However, a lot of people who have been diagnosed with Diabetes are guilty of not adhering to this important practice. Some are misinformed that it is painful. Others find the process too tedious. Contrary to what most people believe, keeping track of your blood sugar levels is no longer a cumbersome process. There are convenient tools just like those for blood pressure. All said and done, buying one is not easy because the market is flooded with low-quality imports from China that look like high-tech devices but are inaccurate and unreliable. We figured that this was a great time to pick some of the best blood glucose monitors in the market. After spending hours researching, speaking to doctors, diabetics and caregivers who have been using these devices, here are the five that we consider to be the best of the lot. Contour Next is the bestselling blood sugar testing kit on Amazon. And the high ratings are there for a reason. This is one of the most affordable glucometer kits in the world that includes everything you need to test your blood sugar levels easily. It is priced at almost half of some of the other leading brands. By the way, it comes from Bayer. So, you can be assured of the quality. The kit includes a Contour Next glucometer, which is compact, discreet and easy to carry. The meter has an LCD screen which displays the reading as well as usage instructions in a clear and visible font. Along with English, the device supports 12 other languages. It tests blood sugar levels between 20 and 600 mg/dL and also allows you to set a custom upper and lower level which is an easy way to spot any discrepancies. Contour Next analyzes every sample multiple times to ensure accurate results, and you can also use the same strip the second time by adding blood to it in case you didn’t get the 0.6 µL of blood with the lancet in the first attempt. This is a great feature which will reduce the number of strips wasted. Replacement strips are very affordable and are easily available in retail stores as well as online. If you are insulin dependent diabetic, then you may have to test your blood multiple times a day. These inexpensive strips will help you save a lot of money in the long run. The kit also contains 100 test strips, 100 Slight Touch lancets, an easy mini lancing device, alcohol pads and a traveling case. Final Word: At the price point, this blood glucose meter from Bayer is unbeatable. It is not the cheapest one that you will come across on the market. But it is certainly one of the best-rated ones by thousands of customers. 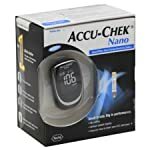 The Accu Check range contains some of the most widely used diabetes management products in the world and the Nano is one of the most popular ones in it. With a compact design and a brilliant display, it has managed to elbow out newer offerings from Roche, like the ‘Connect’. The Nano is a beautifully designed glucose meter. It has rounded edges, is incredibly compact and will fit right into your pocket if you intend to carry it every day with you. A backlit display screen takes up most of the space on the Nano, and even if you have an elderly person using it, readings are clearly visible. The fact that you don’t need to manually code it makes it easier to use. It works with Roche’s Accu-Chek Smartview Test Strips which are not the cheapest option that you have on this list. But the convenience of using the Nano and the accuracy make it a preferred brand for a lot of people. According to FDA tests, the Nano is 23% more accurate than what is deemed necessary in their standard testing procedure. 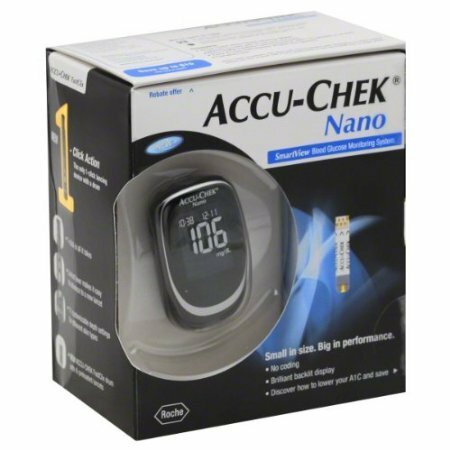 Accu Check Nano is compatible with Roche’s Accu-Chek 360 software which allows you to track a bunch of other important metrics like Ketone levels, Blood Pressure, Cholesterol, your weight, the amount of carbohydrates and so on. This is a very neat addition to a device like a blood glucose meter because it helps you to understand the implications of Diabetes on other aspects of your health. Also, unlike some of the other data management tools being sold with glucometers, it is not fancy looking excel sheet either. The Accu Check Nano kit does not contain test strips. It does contain the Accu Check Fastclix lancet which can be customized to suit your skin type. There are 11 depth levels to choose from, and you need just 0.6 µL of the blood sample. 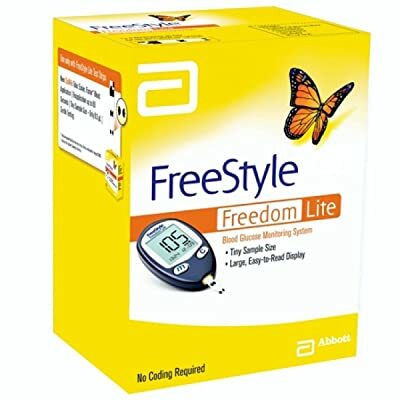 Abbot’s FreeStyle Freedom Lite is one of the smallest glucometers that we have seen. And it has a bunch of features that make it a very worthy contender for the best blood glucose meter in the market currently. For starters, it needs only 0.3 µL of blood to analyze. That’s the smallest blood sample size in the world. If you hate meters which fail to display results citing lack of sufficient blood on the strip, this should be the best choice for you. Further, it has an LCD display, a serial USB port that exports the data to a data management software if need be and the results are extremely accurate. Also, this is a great alternative testing site kit. 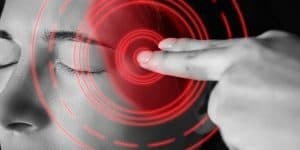 You can give your finger a rest and use it on other parts of your body which are less sensitive. The Freedom lite also displays a 7, 14 and 30 average allowing you to track your blood sugar level trends over the period. The package includes a lancing device, 10 lancets, and a carrying case. Coming to the strips, unfortunately, the Freedom lite stripes are among the most expensive ones on this list. But that’s a small tradeoff for getting an extremely accurate and reliable device that you can easily carry. Also, a lot of people mistake this to be the Freestyle Lite which is a different meter with an integrated light that gets activated when the test strip is inserted into it. This does not have a backlight or a testing strip light. The Ultra2 from One Touch is a simple blood glucose meter with a barebones interface. It works fast, is pretty accurate and it displays numbers in a large and visible format. For low light situations or for elderly people who find it difficult to see, there’s a dedicated LED light or a backlight button which lights up the screen. It is compact enough to slip into your pocket or purse, and it also displays averages for up to 30 days. Sounds like pretty much everything that you’d expect from a Glucometer. The let down is the interface. It is an obsolete one that requires manual coding on the vial every time you want to test a sample. Not only does this make the process cumbersome, but it also makes it slower. While the Ultra2 only takes about 4 seconds to display the results, the actual process gets delayed due to the manual coding. On the other hand, there are people who still prefer using old-school blood glucose meters, and they love the interface of the Ultra2. 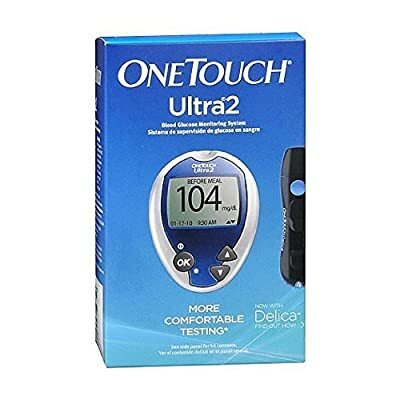 The Ultra2 can store up to 500 test results and also allows you to download it to a PC or smartphone provided you buy the OneTouch USB data cable. It is compatible with the OneTouch Diabetes Management Software which is free only for Windows. Another important detail that most people don’t consider while buying a blood glucose meter is the expense of the test strips. So, it’s not an inexpensive choice. However, the strips are versatile and can be used with any of One Touch’s glucometers. 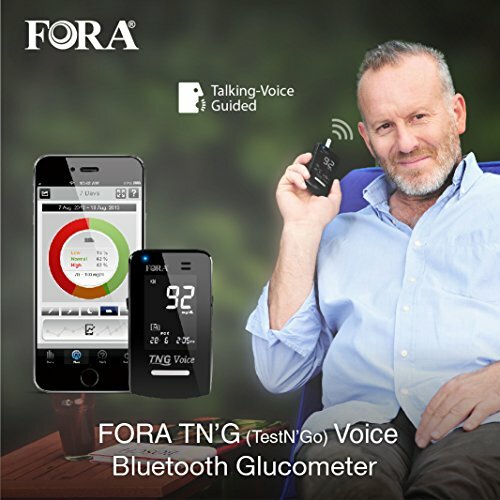 The Fora Test N Go Voice is a new entrant into the world of blood glucose monitors. And at a time when most of the models are struggling to offer beyond the basic features, it comes across as a refreshing change. It has an integrated audio guidance system that reads out your blood test results to you. That might not seem like a big deal to a lot of people. But vision problems are a common occurrence in advance stages of Diabetes. Having an audio guidance system makes it a lot easier to use the meter without assistance from a caregiver. Also, the display is a high contrast one. So, irrespective of the light conditions, you will be able to view it clear and sharp. The glucose meter is slightly bigger than the other ones on this list. But that’s mainly due to the large-sized display. It looks stylish and can almost pass for an iPod. More importantly, it can store up to 450 results in the internal memory and connects via Bluetooth to the iFORA app which is available for both Android and Apple. The wireless connectivity reduces the hassles of messing around with cables to transfer your data to the data management software. You can do it just about anywhere and anytime. The Fora Test N Go works with Fora’s test strips are available at a very economical price. The caveat is that the strips are not available yet in retail outlets. So, you’d have to place your orders in advance to ensure that you don’t run out of them. 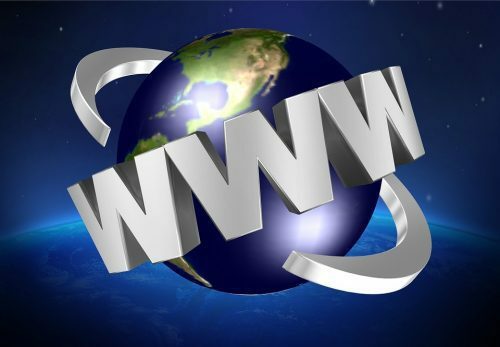 So, despite being a new company, Fora is fast gaining in popularity among consumers. 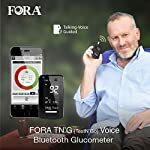 If you are looking for a reliable and accurate modern glucometer, then the Fora Test N Go is one of the best options at hand. We have covered each one of these models in detail and have laid out the pros and cons for you. That’s as unbiased a review as it can get. 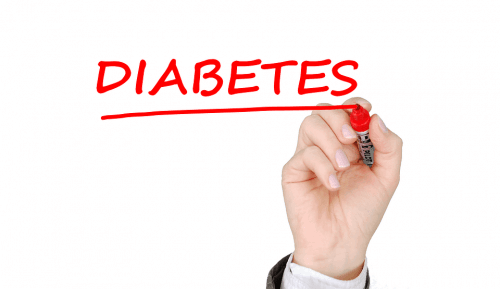 While you can pick any of the above-mentioned blood glucose meters without batting an eyelid, it pays to be informed about the factors that one must consider before making a choice. Blood Glucose meters will most likely be a part of the rest of your life. And picking one that best suits your lifestyle makes it a lot easier to work with. Here are a few important factors that you must consider before buying one. Insurance Coverage: Undoubtedly, the most important aspect of picking a blood glucose meter is to know whether your insurance covers it. 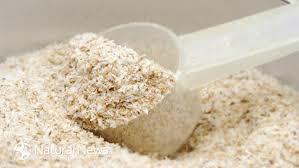 The good news is that most leading brands of glucometers are covered by Insurance. But that’s just the upfront cost. You’d also want to know the number of test strips per month that are covered by insurance. Depending on whether you are on insulin or not, this number may vary from one company to the other. If you have been advised to test your blood multiple times a day, then those numbers can add up pretty fast. That’s one of the reasons why we have included the cost of the test strips for each of these meters. The cost of the meter: You may like the fanciest meter that a brand offers but your insurance may only cover a small fraction of the cost. Since you will be paying the difference out of your pockets, you’d want to know the actual cost of the meter. Ease of use: A glucose meter must be easy to use. It must be easy to hold, portable, and must include clear instructions, have minimal buttons and have a large high contrast LCD display. These are some of the bare minimum features to look for. Some people may need specialized features like a backlit screen or an audio guidance system. There are specific models that are designed for pediatric use which are colorful and attractive. Automation: It’s 2017. You shouldn’t have to deal with manual coding errors on your blood glucose monitors anymore. So, we highly recommend automated coding meters that let you scan a code on your smartphone to calibrate the meter to a new set of strips. Connectivity: Most glucose meters allow you to connect the device to a PC or a smartphone and download your readings to data management software. Some offer a basic USB port while others offer wireless connectivity. It all boils down to your personal preferences. It goes without saying that wireless is easier. Another factor that doesn’t receive as much importance as it should is the data management software itself. Some meters come bundled with a free copy of the software while others are payable. While there’s no dearth of free data management tools for diabetics, it is always better to work with a tool that your device is compatible with. Memory: Most glucose meters have an inbuilt memory that will store your readings. Some have a larger memory than others. The minimum is 300-350. The more, the merrier, though. Having a larger memory also makes it possible to view averages over a period without downloading the data to a computer. The readings: Most of the blood glucose meters do not offer anything beyond the basic readings. 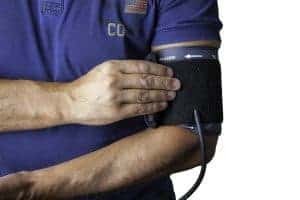 However, some models can also allow you to track other features like the cholesterol, ketones, carbohydrate intake and blood pressure all of which can be vital in assessing the impact of your blood sugar levels on your health. Time taken for testing: You’d think that a second or two doesn’t make a huge difference to the time that you spend with your glucose monitor every day. But when you are using the device up to 5 or 6 times a day, even a few extra seconds can seem like an added nuisance. As a rule of thumb, anything that takes less than or equal to five seconds is considered to be good. None of the devices that we have picked in this list take more than five seconds. Sample size: Once again, you’d not attribute too much importance to how much blood it takes to test in your meter. It’s just a prick after all. But doing this multiple times every day for the rest of your life can make it seem like a lot, especially if your meter shows you an insufficient sample error. To add to this, if you are sensitive to lancing, then even a teeny prick is going to be an ordeal. Typically, a blood glucose meter needs at least 0.6 µL of blood. However, there are some models which need just 0.3 µL. Alternative site monitor: The fingers are the most sensitive part of your body that you can take your blood sample from. If you prefer pricking less sensitive parts of your body, like your arms or your thighs, then look for alternative site monitors. The FreeStyle Freedom Lite is a possible choice in this category. A possible tradeoff is that results tend to be less accurate especially if your sugar levels are spiking or dropping rapidly. 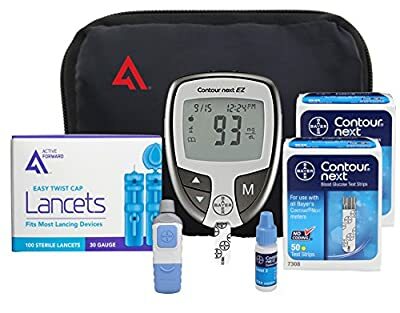 Starter kits: If this is the first time that you are buying a blood glucose monitor, you can check out a starter kit that gives you better value for money. These kits typically include everything that you need to start testing your blood sugar levels. That includes lancing devices, test strips, alcohol pads and a glucose meter. That’s it, folks. We hope that this helps you understand the various options you have and allows you to pick the right one for yourself.